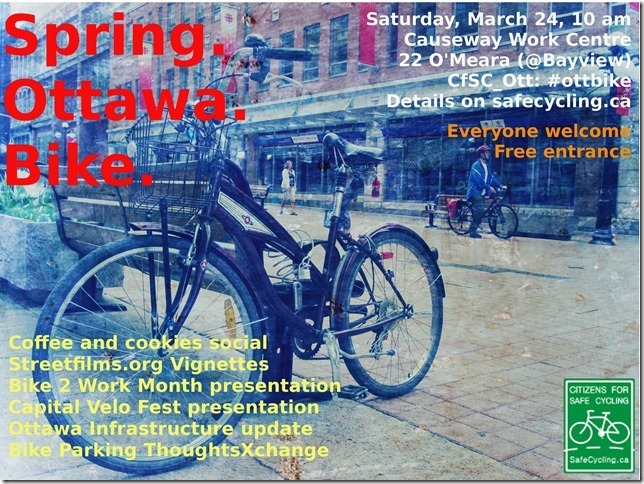 Citizens for Safe Cycling (CfSC) is holding a spring bike event, aptly called Spring.Ottawa.Bike. It’s both a get-together and a chance to learn what’s in store for Ottawa cyclists this year. CfSC promises coffee and cookies, a few Streetfilms.org short films, a discussion on bike parking, and information on upcoming initiatives like Bike to Work Month, Capital Velo Fest and the City of Ottawa’s plans for bike infrastructure this year. The event takes place on Saturday, March 24 from 10 a.m.-12:30 p.m. at Causeway Work Centre, 22 O’Meara Street in Hintonburg. They ask that you RSVP to advocacy [at] safecycling [dot] ca. CfSC is a non-profit, membership-based organization that promotes safe and environmentally-friendly cycling in Ottawa—check them out at http://www.safecycling.ca/.